Passwords. Can't live with them, can't login without them. 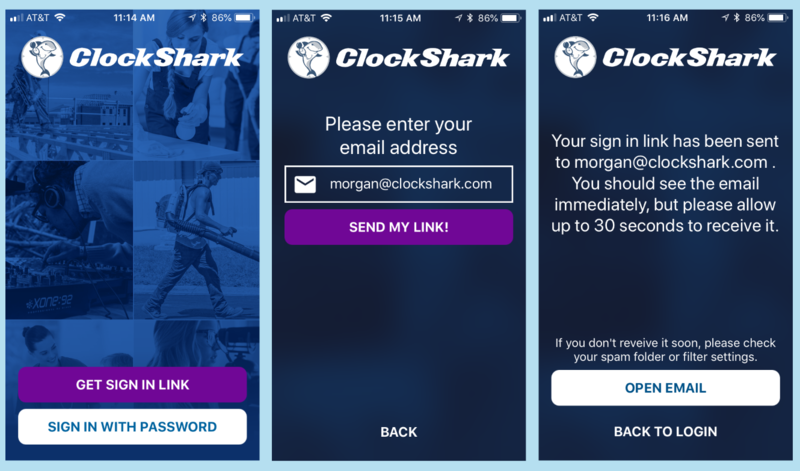 For employees and administrators logging into the mobile app, ClockShark offers an alternative sign-in method that doesn't involve using passwords and saves lots of time. Users simply enter their email address, and then login to ClockShark by clicking link that we send to their inbox. That's right. No more memorizing passwords. Open the ClockShark mobile app and press the purple "Get Sign In Link" button. Enter your email address and press "Send My Link!" Open your email inbox and find the message. Click the blue "Sign In" button. If your account is locked from too many failed login attempts with your actual password, the purple button can't help you. Let our Customer Support team know, and we'll get your account unlocked for you post-haste. Links expire after one hour, or after being used. Links will also expire as you request new ones, so playing the "Who Can Tap the Purple Button the Fastest" game is strongly discouraged. You're now 100% up and running with this special way to log into the ClockShark mobile app in the event you can't remember your password.